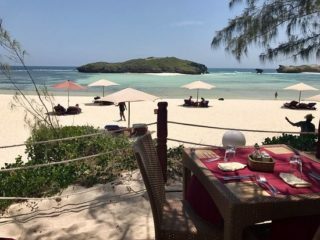 Papa Remo restaurant is yet another incredibly dreamy location situated in Watamu, Kenya. Except this one is different, because as you walk in you’re immediately surprised by what’s in front of you. It’s a scenario that feels almost unreal. If you could imagine those paradise dreams you have, then this place would be their reality. As you walk into the restaurant, you look up and right in front of your eyes appears an island paradise. I couldn’t be more serious. 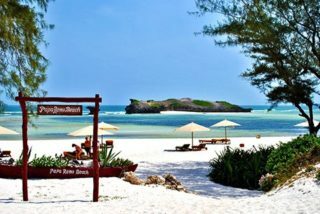 In fact, the pearly white beach that Papa Remo restaurant sits on is called the ‘love beach’ of Watamu. I can definitely see and feel why that is. 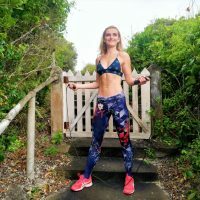 There truly is no need to travel to the Maldives, when you can come to quieter parts filled with African culture that are just as, if not, more beautiful. I’ll have you know that this is not just any beach either. In fact, you can take a swim about 2 miles out. You can swim in crystal clear, light blue waters all the way out to a little island sitting perfectly waiting for you to explore it. On that island, you’ll find the softest white beach sand that gently exfoliates and massages your skin. In addition, there are beautiful rock pools and rock formations to investigate. I was so swept away by the location, that I forgot about eating lunch. By far the most dreamy place I’ve visited in Watamu. If you want to impress your partner, then take them here! There’s only one way to describe this place. I’d say it’s a breathtaking panorama with idyllic surroundings. To be honest, we didn’t eat lunch there. But we had a look at their menu and I can’t wait to try it. I will definitely keep you all posted on the meal we do eat next time. We were completely in awe of what surrounded us. I’ll get to what they had on their menu in a bit because there were some amazingly tasty and healthy options. Interestingly, there are quite a few little restaurants, cafes and shops popping up here in Kenya with a focus on health too. Like I said in my previous article, the Kenyan’s are fit! When we walked into the restaurant we took a look up and saw the incredible waterscape that lay before our eyes. So we made a bee-line toward it. We didn’t even stop the order a drink, we went straight to the water. You could literally swim all the way across to the middle of the ocean where the little love island is. It’s quite magical because there are hardly any waves, just swirls of water, and because it wasn’t high tide just yet, the current wasn’t too strong. I am a little paranoid about swimming casually into the ocean, but these waters are crystal clear so you can see where you’re swimming. It’s quite beautiful because when you look down you might even be able to see some reef fish. 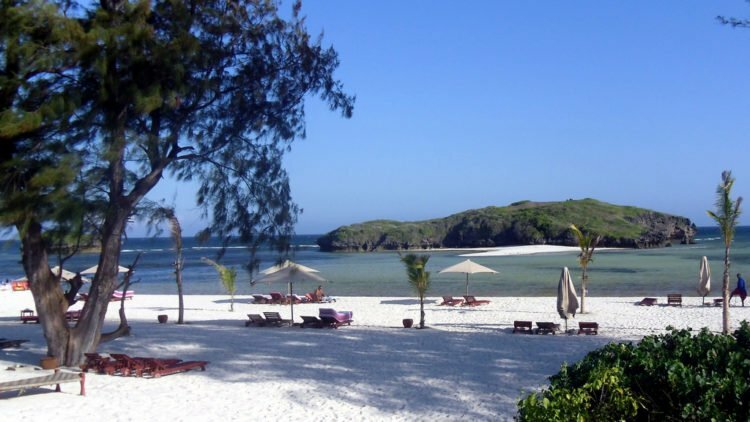 There’s also no waves because Watamu is surrounded by three huge coral reefs. These break the waves far out before they get closer to the shores. Once we made it to the little island, we spent most of the day swimming, tanning and exploring the rock formations. I think that this is what living life healthy is truly about. Get your adventurous spirits on and travel to Kenya! This wonderful restaurant has so much to offer, besides its dreamy location. They can prepare exquisite food for lunch, dinner and snacks. There is also welcoming energy that surrounds the place and they won’t say no to celebrations either. 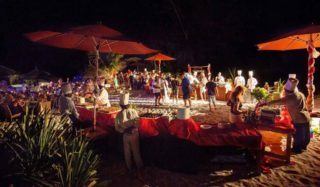 Whilst listening to the relaxing sounds of the ocean, Papa Remo Beach can create a magical celebration of your choice, whether it’s a beach party, birthday or a wedding. The venue specialises in organising personalized weddings for your memories. And once a week, Papa Remo Beach becomes Beach Party, with music by local DJs. 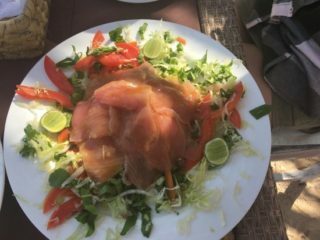 This tropical, beach restaurant has delicious pizza fresh out the oven, seafood caught from the ocean and healthy salads. There is also an exciting array of snacks and cocktails to choose from if you feel a little naughty. I love their freshly squeezed juices. This juice is made from pineapples and coconuts that grow on the palm trees right in front of you. We sat down and enjoyed a freshly squeezed juice each and got to soak up the view. If you’d like, you can also opt for one of their generous mixed seafood platters. This is basically a Pescatarian’s heaven. You can receive freshly cooked lobster, calamari, crab, prawns, red snapper, oysters and even octopus all in one! And then for dessert, you can indulge in a colorful plate of sliced fruit with a cup of Kenyan coffee. Best in the world! I hear their crab pasta is to die for! You can have any fish you like really. Papa Remo sources their ingredients locally. They also get their cheese from a cheesemaker in Watamu. There are only a few speciality sauces that come from Italy, which is definitely the inspiration. You can order octopus and potato salad as a starter or tuna carpaccio and a light salad. Each seafood dish depends on what the catch of the day is. And all pizza-dough is hand-made, soft, thin and crispy. You can choose from red snapper, tuna or jumbo prawns. Or, maybe you’re in the mood for grilled squid with some lemon? The pasta is homemade. Apparently, the Batti Batti pasta is made from sea cicadas. If you’re not into seafood then there is the option of chicken skewers and chicken cutlets. Meat lovers can also order pork chops, grilled fillet, a hamburger, baby marrow carpaccio or beef scallopini. This a thin cuts of crumbed sautéed steak. All in all, a magical place with pearly beaches, good food and an island. You can spend the day swimming, sunbathing and, when it is low tide, take a walk to the islands and explore the rock pools.